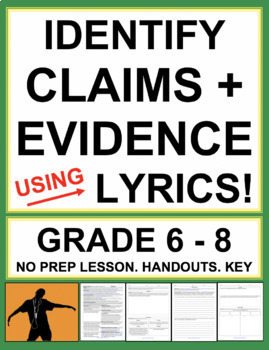 Use song lyrics to teach identifying claims, evidence and argument. Students identify argument, claims, and relevant text evidence using music lyrics with this no prep music as poetry lesson plan, student handouts and answer key. What are the main arguments and specific claims behind each argument? Which claims are supported by relevant and sufficient reasons and evidence and which are not? Middle school reading nonfiction text activities are fun with song lyrics and music! 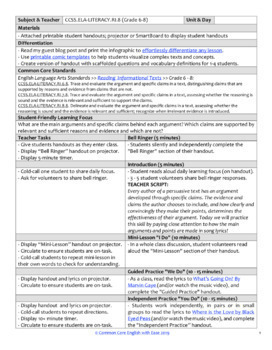 Extra Reusable Assessment Handout to use with ANY text! Simply load the music videos, printable lyrics, print, project & go! This is a lifelong tool! TIP: If you want to play the song or music videos as well as use the printable lyrics, but your school does not allow YouTube, simply play the song from your phone or google search “youtube to MP4” on your home computer and use any of the first sites to instantly convert the included YouTube links to MP4 files to play from your school desktop, SmartBoard, PPT, etc. BONUS: Lyrics can be used to spark discussion to teach emotional intelligence and social emotional curriculum (SEL). CCSS.ELA-LITERACY.RI.6.8. Trace and evaluate the argument and specific claims in a text, distinguishing claims that are supported by reasons and evidence from claims that are not. CCSS.ELA-LITERACY.RI.7.8. 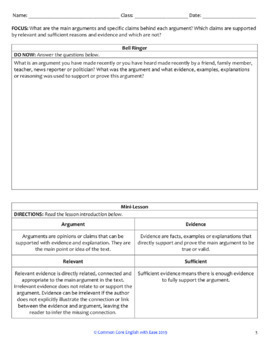 Trace and evaluate the argument and specific claims in a text, assessing whether the reasoning is sound and the evidence is relevant and sufficient to support the claims. CCSS.ELA-LITERACY.RI.8.8. Delineate and evaluate the argument and specific claims in a text, assessing whether the reasoning is sound and the evidence is relevant and sufficient; recognize when irrelevant evidence is introduced. Why using boring texts when you can analyze song lyrics? Perfect for reluctant readers and students with learning disabilities. 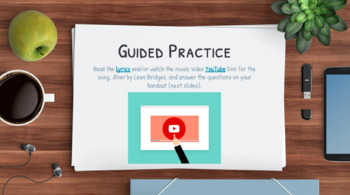 Common Core ELA Test Prep is FUN with MUSIC LYRIC ACTIVITIES! Use music to teach inferencing! Use music to teach theme! Use music to teach main idea and summary! Use music to teach plot, conflict, mood and tone! Use music to teach characterization! Use music to teach irony, dramatic, situational and verbal! Use music to teach rhetoric, ethos, logos and pathos! Use music to teach point of view and author's purpose! Use music to teach compare and contrast and synthesis! Use music to teach literary analysis! THIS PRODUCT IS NOT AFFILIATED WITH ANY OF THE LYRICS, ARTISTS, PRODUCTION COMPANIES, LINKS, WEBSITES OR ORGANIZATIONS LINKED IN THE PRODUCT; IT IS FOR EDUCATIONAL PURPOSES ONLY. WANT MORE PRINT & GO CULTURALLY RELEVANT RESOURCES?